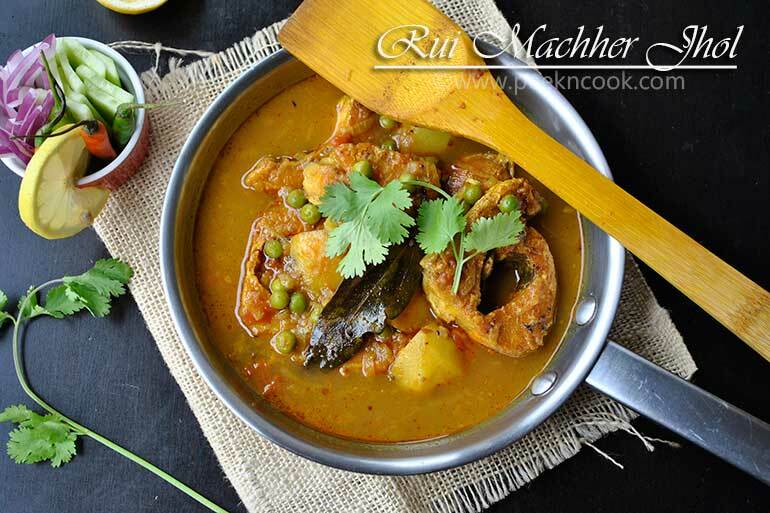 Machher Jhol or Machha Jhola is a traditional Oriya and Bengali spicy fish stew. It is in the form of a very spicy stew that is served with rice. Machher Jhol is liberally seasoned with turmeric, garlic, onions, and grated ginger. Potatoes are added to the stew as a thickening agent. Tomatoes are also added to impart the dish with a reddish color which is preferred by the people of Bengal. This Machher Jhol is a part of almost every Bengali familys' lunch menu. So this should be a mild type curry with very less spices. This curry is good for helath. Clean the fish pieces and marinate with 1/2 of turmeric and salt. Then heat the oil in a kadai and fry fish pieces till golden brown. Now fry the eggplant & potato in the same oil. Now in the remaining oil add panch foron and onion and fry till soften. Now add ginger paste, tomato paste or tomato puree into the fried onion and again fry . Now add the potatoes and eggplant and fry. Then add cumin powder, red chili and turmeric powder and little water to it and stir. When oil separates add salt and fry for few minutes. Now add the fried fish and again fry it for 1 minute and after that add water and reduce the heat and let the gravy boil. When the potatoes have cooked remove the kadai from heat and garnish the gravy with garam masala powder,chopped coriander leaves and green chilies and serve with steamed rice. If you like the recipe, then go to my Facebook Page and like my page for regular updates. Serve with a piece of lime It will taste awesome.